I received my XPS 9560 last week, and it's a nice machine, however I'm having issues getting keys to register as being pressed. At first, I thought that I was just getting used to the keyboard and missing some of the keys whilst typing - they work most of the time, however I've started noticing some patterns and narrowed down the cause. Essentially, the problem occurs if I do not hit the keys exactly in the centre of key. Pressing either the edge or, more commonly, the corner will depress the key a significant amount, but apparently not enough to register as a key press. 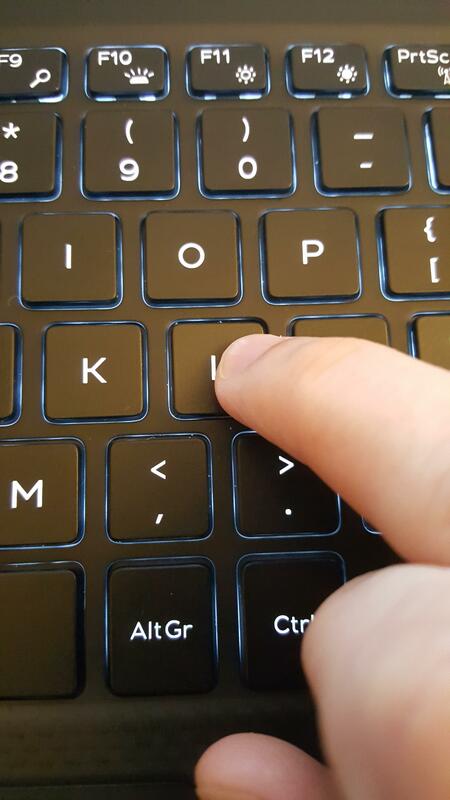 It is lost obvious when pressing either the right hand edge, or bottom right hard corner of a key. I'm certain it's not a software issue as this has been happening across multiple Linux installs and whilst using Windows. Is this normal behaviour and something others are able to replicate? It's killing the typing experience for me on what is otherwise a very nice to use keyboard, and may be enough for me to return the 9560. That user scenario (missing the center of a key by that much) is not something we nor our manufacturer would test. Your post is also the only hit I could find when searching for, "XPS 9560 keys unresponsive". Maybe some other XPS 9560 users will chime in. I asked a number of reviewers how the keyboard on their devices compared, however the ones that have got back to me say that their keyboards don't appear to show the same issue, which makes me believe I that have a particularly bad keyboard. I have found one other person, with a Precision 5520, who was able to replicate the issue, and had been noticing that they were getting things such as passwords consistently wrong, which I suspect comes back to the fact that touch typing on keyboards with the issue is near impossible. Using the purchased warranty (either Return To Depot repair or Onsite), Technical Support could setup service to replace the keyboard. Just had a tech replace the keyboard which has fixed the issue. Seems I'm the first person to have experienced this issue and hopefully just got unlucky. I too have the same issue with the tab key. I also have issues with a few other keys exhibiting similar (though less egregious behavior). The tab key is particularly bad. I just submitted a ticket and thought I'd comment here to raise awareness of this issue. I'm having the same issue with my 'i' key. Very annoying. Same problem, same key ('i').